E-Commerce as we know it today will have ceased to exist by 2021. What are the reasons and what will the future look like? E-Commerce was originally created to allow consumers to buy products online without having to go to a physical store. On the seller side, this movement implied cost savings by not having a physical store, as well as the ability to sell their products to a broader audience with world-wide shipping. 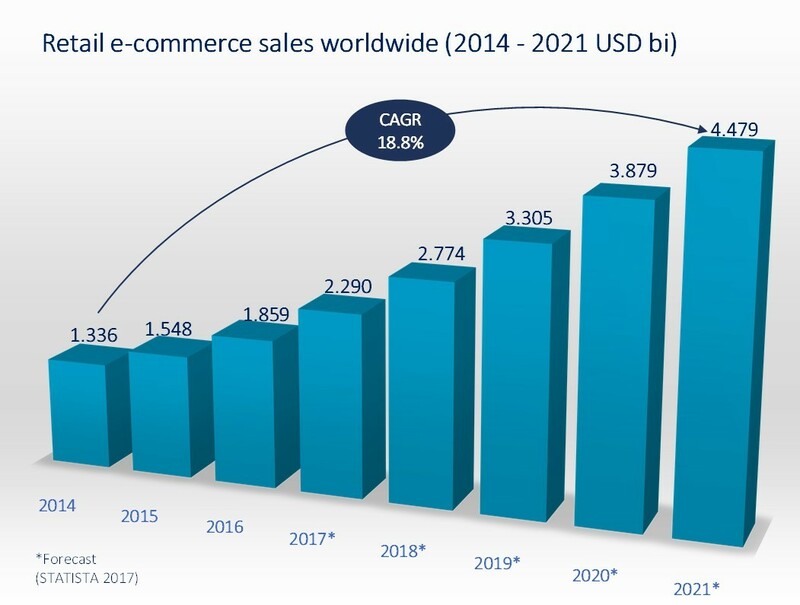 Retail e-commerce sales reached 1.86 trillion USD in 2016, and are projected to grow to 4.48 trillion by 2021 – a compound annual growth rate of 18.8%. However, in 2021 e-commerce as we know it, along with the multichannel model, will be dead. The reasons are changes in consumer behavior, information (access to data), and the power of automation, especially machine learning. Consumer behavior and preferences have fundamentally changed. Today’s consumers have very high standards as they are much more conscious about product performance, sustainability and quality. Local smaller players are arising who offer innovative, premium and personalized products, competing with the traditional retail – and mostly standard – products from the big players in the market. Furthermore, shoppers now have more access to information than ever, and are using it extensively in their decision-making process. Where to get the best deal? Where to get coupons and promotions from? Which of the various marketplaces offer the cheapest product with free shipping? How to avoid going through all sorts of sources and providers in order to find the best quality? How to ensure that a certain product does not have any allergic components or does not come from an untrusted source? What are the reviews, and how is this product rated by other customers? How trustworthy is the supplier? Will the product arrive by the time it will be needed? All this is exhausting for the customers, and if these questions are not answered satisfactorily and immediately, they might be reluctant to buy. Therefore, the ability to 1) understand the consumer problems, and 2) automate the use of information (data) in order to generate insights will be the key to surviving in this competitive, real-time environment. But how? Recent technological innovations have helped e-commerce to evolve. Be it by means of automation through machines and devices, as we see them in manufacturing on the shop floor or in warehouses, or by bringing the shopping experience on the go with smartphones and tablets. 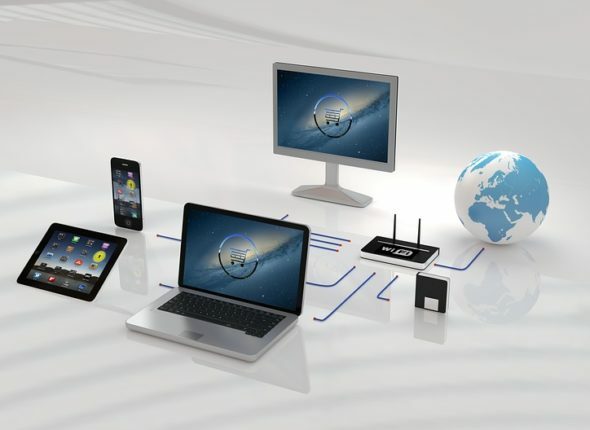 The number of connected devices has been exponentially increasing every year – on both the user and the manufacturing side. Today, with Machine Learning and Artificial Intelligence, e-commerce is shifting to a new paradigm. Consumers want shopping to be pleasant, fast and hassle-free, so delegating decisions to machines that solve their shopping problems makes their lives much easier. Welcome to the era of a-Commerce (automated Commerce)! In the future, machines will predict any kind of consumer product demand and –ring in the era of a-commerce! For daily-use products, such as food or personal care, smart objects (devices, machines) and sensors will scan and manage your fridge and cabinet. They will detect products you might run out of soon and make decisions on where to buy which product. Maybe there is a new brand or a new variation on the market, or you are allergic to an ingredient or component? Machines will handle it. They will also decide where and when the delivery will take place, because – of course – they know your schedule and the most convenient locations. Most importantly, the machines will run simulations on prices and delivery times among all available suppliers in order to get you the best deal, regardless whether it is a combo purchase at one single online store, or by placing multiple orders through many suppliers. Smart objects will be all around. For example, they will track changes in your body. So, let’s say you have lost weight or gained muscles. And maybe the weather in your city will shift in the coming weeks. Your automated shopping assistant will then scan through your closet looking for pieces of clothes you have, and match them with the colors you like and the latest fashion trends in order to get you new, perfectly fitting clothes, shipped without you even having to think about it. Or, even further, it will be technically possible to predict what you will happen to like, what you will happen to want or desire based on your personal interests, believes and likes following your fingerprint in social media. A cross check with your bank account and your shopping behavior will also play a role in the automated decision-making process. Finally, you will be positively surprised by receiving products you did not order (yet) or you weren’t even aware of. Stores will be highly automated. You will be surrounded by all sorts of interactive devices in order to heighten the shopping experience, all linked real-time to your social life/profile and virtual wardrobe. As a consequence – with all the customer information in hand – stores will achieve massive inventory reductions with the ability to predict the demand or drive it by creating personalized, relevant promotions. When leaving the store, no checkout is necessary anymore at the cashier as payments will be triggered automatically in the background. Purchases will be delivered directly to your home awaiting you upon return from your shopping trip. For some, this all might sound a little too futuristic or infeasible in the near future. However, it is closer to reality than we think. Many industry players are already making progress at a very fast pace and are at the vanguard of setting trends for the future of commerce. All of the scenarios described here are either already being put into practice or piloted and prototyped in so-called future labs. How can you build balanced brand positioning among channels (online/offline)? How should you build the perfect go-to-market strategy when interacting with humans and machines? In the age of the Internet of Things (IoT), Artificial Intelligence (AI), Virtual Reality (VR) and digitalization, the biggest asset is information. In order to keep up with trends and survive in this environment, companies are advised to allocate enough budget to IT as part of the corporate marketing strategy. How ready are manufacturers, distributors and retailers to manage and handle demand in real time and to promptly respond to changing market needs? How much time do suppliers and distributors need to react to constantly changing demand and respond to the consumer at the proper speed? How can we combine other disruptive technologies, such as Blockchain and IoT to address logistics-related issues? A connected world needs a large amount of transactional data every second. What is your ability to be connected in this environment, to manage the data and to generate insights for your business? Are you ready to say goodbye to e-Commerce and welcome to a-Commerce? We am eager to hear your thoughts. You can find more information on CPG industry trends here. I would like to thank André Pinto for his contribution to this article. Partner at CAMELOT and acknowledged thought leader for supply chain management in the CPG sector.